Try these Rum and Raisin Muffins for a delicious and sophisticated treat that you can bake at home and know that it is sugarfree. When my husband first tried these muffins he said, "Wow! You have got to put this on the website!" I agree. 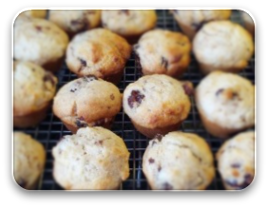 The day I first baked these new muffins, I also made the chocolate muffins again. Both are great recipes, but when I go to the freezer today there are plenty of chocloate muffins left - we have both been going for the Raisin Muffins! They are best enjoyed within a few days of baking and kept in an airtight container. They also freeze well. They are lovely as a pudding if you heat them in the microwave and serve with cream or sugarfree icecream..
Place raisins and rum into a small saucepan. Stir gently over low heat until most of the rum is absorbed into the raisins. Set aside to cool. Sift dry ingredients into a bowl. Add the wet ingredients, including raisin mixture and stir until just combined. Spoon mixture into a greased mini muffin tray. Makes 24 mini muffins. Bake at 170 deg Celsius for 15 mins. Would you prefer Chocolate Muffin Recipes? Or Shortbread Cookies?